The Mini DisplayPort to VGA Adaptor lets you connect a standard analog monitor, projector, or LCD that uses a VGA connector or cable to a Mac with a Mini DisplayPort. Every Mac with a Mini DisplayPort allows you to connect an external display or projector using an adaptor. You can use an external display as your main workspace or to extend your desktop, or you can work in mirrored mode with a projector so you can view what your audience sees. 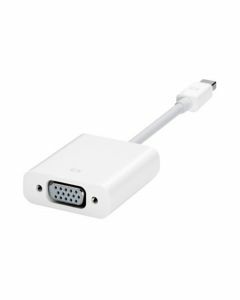 Use the Mini DisplayPort to VGA Adaptor to connect your Mac to a standard analog monitor, projector, or LCD that uses a VGA connector or cable. Review the documentation or check with the manufacturer of your monitor to make sure you're choosing the right adaptor.